I had a nice Yuba River and pond weekend. Hook a few but lost most of them. On Saturday I fished a rainy and windy day out on the Yuba. I never have much luck in the rain but I managed to land one nice 17'' trout after fishing a tough day. It fought like an 8# fish just sitting in the current making a few headshakes now and then. Strong and fun fish to land. Definitely one of my better fish out there this year. The original idea was to just fish the ponds on Saturday which I did as well. I quick-released a nice 12'' bass and hooked something bigger that I lost. I saw a bunch of bass roll on the surface but I couldn't figure out what they were eating.The ponds are turned over which tells me I will need to buy a new spool with some sinking line to be effective out there. Something that urked me that day was a drift boat rower accusing me of stepping on redds which I saw and walked around. I care just as much as you about the river and try to do the best not interfering with nature. I'm sorry I can't afford a fancy boat to fish from for the entire day. The following morning I set out to the Yuba again with Dan. We fished the "middle section" of the Yuba and after predicting that I would catch one on the first cast it happened. 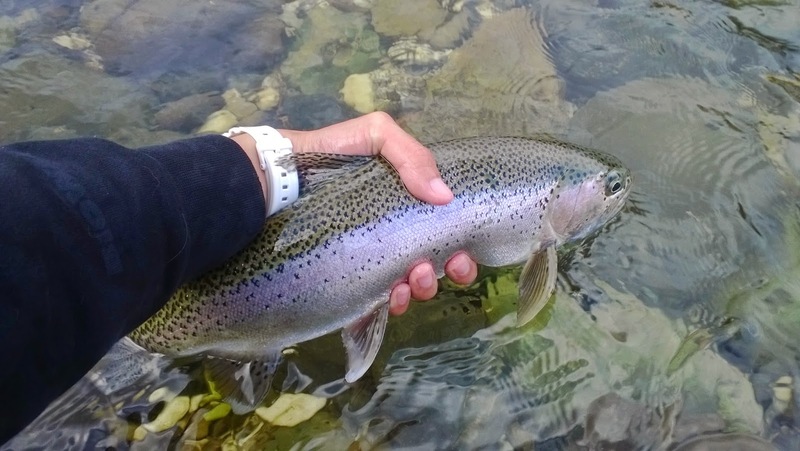 I lost it and set out my second cast and hooked another fish that looked about 15'' which was quick-released. I didn't land any but I helped net one of Dan's two bows he caught for the day.